More informations on each symbol. 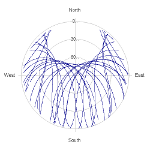 The satellite tracking graph has been calculated for all stations for the first day of each month. If you wish to have a graph for another date, choose the 'Calculate a specific date' option. Link to Sea Level Differences (Satellite altimetry minus tide gauge data).